Lock in a great price for Villa Hodak – rated 9.2 by recent guests! The room was very clean and the lady who helped us to check-in was very friendly! Excellent location. Wonderful space. Lovely host. Clean, quiet, comfortable. Restaurants and market near by. Our hosts were quite lovely and as helpful as can be. It's an amazing value. We were welcomed even though we needed to arrive very late. The room was spacious and spotless, the bathroom was great, and the wifi was perfect. Located near the number 1 entrance to the National Park (about 5km/3miles). Spacious, clean room for 3 with ac, comfortable beds. Room had a fridge, shower utensils, etc. Market is on site and on the other side of the street. A little swimming area along the river was a great refreshment after a day at the Plitvice Park. It is located about 100m down a rougher path. Owners were very friendly and helpful. Lots of activities and restaurants nearby. Great stay for a few days to discover the park and surrounding area. We would stay there again. I can also answer questions in German. We were fortunate to share a self catering unit so we didn't eat in a nearby restaurant . We were given basic cooking staples in unit 1 (a 2 bedroom, 2 deck) unit as well as a kitchen.Unit 4 was a single queen bedroom with daybed. This too had an en suite bathroom, coffee supplies and a small refrigerator. Directly below wad a market for meats, cheeses, fruits and regular groceries plus daily fresh breads. Sleeping was easy in quiet rooms with comfortable beds. Petar and Danica were fantastic hosts. The apartment was spacious clean and homely. Close to restaurants and above a cute little supermarket. Our apartment even had two balconies! Wonderful place to stay. It was really clean and tidy. The owner was so kind. Good location. Big rooms. Hostel owners were extremely kind and helpful, despite not speaking English. 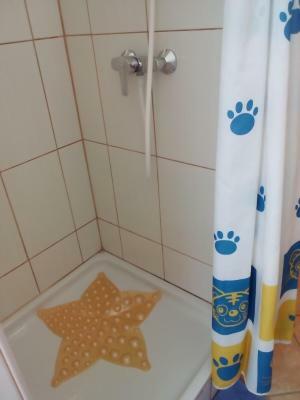 Bedrooms and toilets are very clean. It's the perfect location to stay the night before heading to Plitvice National Park. There's also a supermarket right next door so all your grocery needs are sorted. And it's a 10 minute walk down to the Korona river if you're in need of some cooling off. Villa Hodak This rating is a reflection of how the property compares to the industry standard when it comes to price, facilities and services available. It's based on a self-evaluation by the property. Use this rating to help choose your stay! 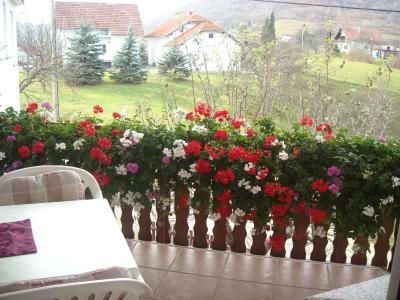 Villa Hodak is located in the village Seliste Dreznicko only 2.5 mi from Plitvice Lakes National Park. It offers free Wi-Fi and comfortable rooms with flat-screen satellite TV and air conditioning. Shared areas including the sunny terrace. All rooms are brightly furnished and offer a desk and chairs and a TV. Private bathroom provides a shower and toilet. There is a supermarket and a bus station close to the guest house. A couple of restaurants serving specialties from the Lika region can be found within a 900 feet radius, while the nearest restaurant is only 150 feet away. Hodak Villa is 0.6 mi from the clean Korana River and 6.2 mi from Barac's caves close to Nova Krslja. All guests can benefit from free parking in front of the building. When would you like to stay at Villa Hodak? This apartment features a seating area with a flat-screen satellite TV as well as an a equipped kitchen. A private bathroom provides a shower, a toilet and free toiletries. House Rules Villa Hodak takes special requests – add in the next step! Please inform Villa Hodak of your expected arrival time in advance. You can use the Special Requests box when booking, or contact the property directly using the contact details in your confirmation. A very nice and helpful host. The hostess is welcoming but does not really speak English. The microwave is not in the room but in the corridor. The room is spacious. Free parking available. Nice host. Nice rooms. Thumbs up recommended. The toilet was not in the room, but when I booked the room online, I didn't notice that on their description. Host was lovely lady, gave us a cold beer on arrival, very appreciated, was extremely friendly, no english, but we managed fine communicating, Room was clean, comfortable, views to the mountains. apartment is only 4 kms to Plitvice. missed the sign to start with,, the rooms are above the supermarket, so close to get supplies which we did for making sandwiches for the park excursion the next day. Restaurant 50 metres away for dinner if u wish, and breakfast the next morning. excellent location. The hostess was a nice lady. Her apartment was clean and spacious with comfortable beds and good air conditioners. 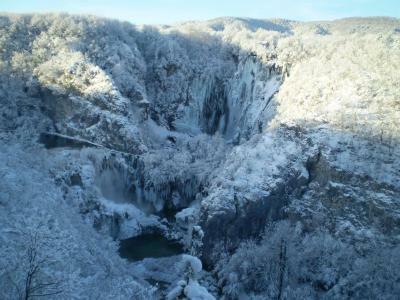 It is located near the Entrance 1 of the Plitvice Lakes with supermarkets and restaurants just nearby. An excellent place to stay! Right on the main road but our room was very quiet and had loverly views to the mountains. Our greeting was very friendly and we were made to feel at home, including being provided with a cool drink. Bed fine, wifi fine, limited space with two beds in room (1k,1s) Bathroom was "older" but had the best water pressure ever, showering was just great. The lady was very kind, the room was clean and well-furnitured. The wi-fi was a bit slow, but a glass of wine was waiting for us in the fridge so we did not annoyed ;). The Villa is on the road so it was easy to find, and it's only 7 kms from the entrance of Plitvice National lakes. Absolutely raccomandated! Our experience was wonderful even though the hostess spoke very limited English . Very hospitable hosts. Very clean.